"I actually think some form of charge for using the NHS could be necessary. But people who work in health have to be involved in those changes." Nursing is the hardest job in the world. It’s physically difficult, it’s emotionally difficult and on top of that we’re under huge pressure to be extremely professional – if we’re not professional, people can die. I get paid under £22,000 ($28,300) a year to do this job. The government keep saying that nurses are earning an average of £31,000 ($39,900) but it’s just not true – we don’t know where they got that figure from. Most nurses, particularly newly-qualified ones like me, get paid nothing close to that. I’m thinking about moving to Australia. 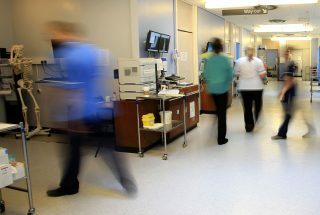 It makes me feel guilty – we desperately need to keep nurses in this country, but in Australia I could be earning £40,000 a year, working in better conditions, in a properly funded health service. Part of me just thinks I should be selfish. I can only say any of this because I’m speaking anonymously. If I were to stand up and tell the truth, I’d find it difficult at work. The profession is under huge pressure. Anything that could be seen as speaking against my health board or nursing in general – bad press, basically – would be really frowned upon. What is the pay cap? The UK government has frozen the amount salaries for people in the public sector – nurses, civil servants, teachers, etc – can rise. It’s what’s called the 'pay cap', and is currently set at 1 per cent. The problem is that the cost of living in the UK is also rising – and there’s no cap on that. Which means that for people whose pay is capped, their ‘real wage’, or the amount of things they can buy with their money, is falling – the same wage doesn't go as far, because it’s more expensive to rent a flat, buy food or pay for childcare. It's part of the government's ‘austerity’ program, which is an effort to reduce spending, but it’s come under a lot of criticism – the Royal College of Nursing has a campaign called Scrap the Cap, and even politicians from the Prime Minister’s own party are saying maybe it needs to be reconsidered. But the situation at the moment is dangerous. I work in an emergency department in a hospital in North Wales. It’s not a London trauma centre, it’s not a massive A&E, but the hospital is still full of patients. There aren’t enough beds, and there are people waiting on trolleys in the corridors. There aren’t enough doctors to see everyone. Our hospital is scraping through by the skin of its teeth. We can’t keep working like this – three nurses on my shift yesterday were in tears because of the pressure they were under. There are so many nurses who just don’t want to do it anymore – nurses who have been battered by their jobs for years and years and years. I know another newly-qualified nurse who turned up at work a few days ago in tears, went straight to the matron and quit. She couldn’t do it anymore. The reason we’re all still in this job is the reason we came into it – we love it. The government is abusing the fact that they know we love our job. They know we want to be there for our patients and they know that we know if we don’t come to work no one else will be there to look after them. They’re using that to keep the pay down. In the UK, the healthcare system is run by the government and most healthcare is completely free for people to use (it’s called 'free at the point of use') – you do pay a small charge to see an NHS dentist, for example. The NHS was founded in 1948, and is seen a bit of a national treasure – A YouGov in May 2017 poll showed that 84% of the UK public believe the NHS should stay in public hands. The current party in government, the Conservative Party, is generally against public ownership, although it hasn’t gone so far as to say it will privatize the NHS completely. But people argue that the government’s increasing use of contractors to provide some services is a form of privatization. Nearly all emergency nursing environments are part of the NHS, which means they doesn’t have to compete for staff. If I were to quit my job, my only option would be to move to a completely different area, where things would be very similar, or leave nursing altogether to get better pay. If it were a business we’d just leave. Those stories you hear in the press about nurses using food banks – they’re real. I’m lucky because the living costs in the area I live and work in are low, and my husband looks after child care, but it means I’m trapped where I am. If I wanted to go and work in a trauma centre in London, which I’d love to do, I couldn’t afford it. It doesn’t feel as though there’s an end in sight, and even if the pay cap is scrapped it won’t be great; at most they’ll just give us a nominal pay rise just to shut us up. I genuinely believe that they’re intentionally pushing the NHS to the point of breaking. They want to privatise it. They want it to be so bad we breathe a sigh of relief when they say, “We’re going to privatise the NHS and you’ll all get amazing pay and the conditions will be amazing,” we’ll all be so grateful because by that point we’ll be broken. A pay rise alone won’t solve all the NHS’s problems. We need more bodies on the ground, we need better social and elderly care so there’s support when people are discharged from hospital, we need a cultural and social change to ensure that people don’t come to A&E with problems that aren’t emergency problems. I actually think some form of charge for using the NHS could be necessary. If patients know they have to pay to see a doctor, they might be less likely to come in if they don’t need to. But I absolutely believe that emergency care needs to be free at the point of use. People who work in health have to be involved in any major changes. It can’t just be the government making those decisions. They can’t be decisions that are being made purely about money and profit – they have to be about providing the best care. But the government doesn’t seem to be willing to engage with leaders in nursing. Nurses have historically been excluded from the higher management of the healthcare system. I just don’t think they care, and they know deep down that we’ll just keep doing the job. This article was submitted anonymously at the request of the writer. I work in the public sector. What’s this election got to do with me? Strikes, ‘humanitarian crisis’, and the busiest week ever. What’s going on, NHS?! This is an excellent article, but you have the first female astronaut listed as Sally Field. Shouldn’t that be Sally Ride? I know she was the Flying Nun, but I don’t think Field actually got high enough to circle the earth!